In Lattice, Admins have the ability to monitor company, department, and individual goals through the admin panel. Under "Admin" in the navigation bar, Admins can visit the "Goals" administration page from the side navigation. Here, there are 4 tabs which can be used to oversee and manage company settings in regards to this feature: auditing, activity, tags and settings. The Auditing page displays a complete list of a company's Goals. 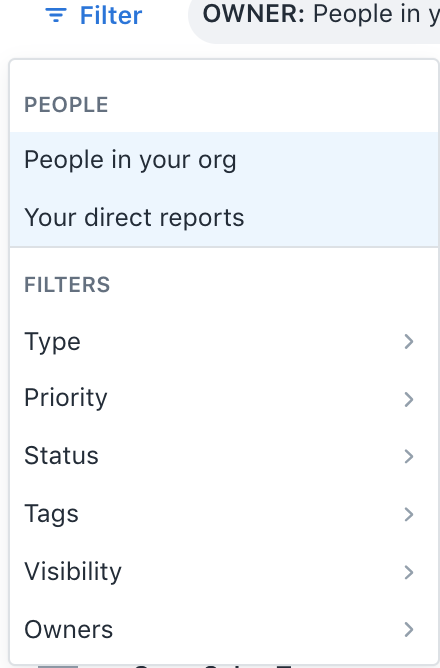 Admins can filter the list of goals by their Type, Priority, Visibility, Tag, Status, Owner, etc. and sort them by clicking on the column headers. 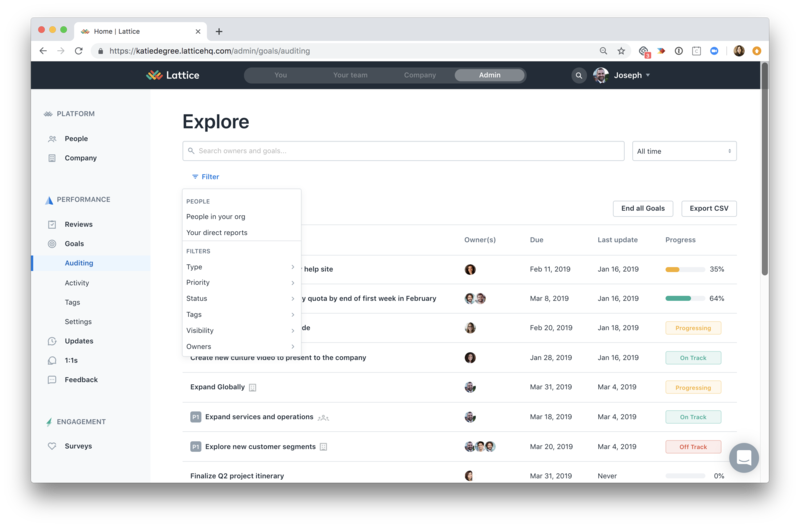 Admin can also sort Goals by People (Either direct reports or people in your org). To export all of the company's goals to a ".csv" file, click on the "Export CSV" button. 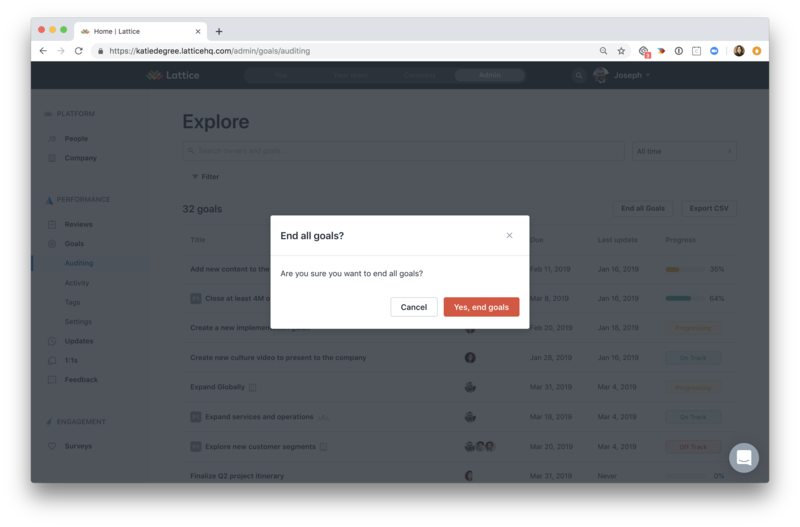 Clicking on the "End all Goals" will end all of the goals displayed on the current page. Be careful, this action cannot be undone after it is confirmed! You can filter Goals by owner and see all of the Goals that an individual "owns." This will include Company, Department, and Individual Goals that this employee is currently an owner of. Filtering Goals by end date allows you to select a custom end date range. You can filter Goals by people by either selecting "People in your Org" or "Your direct reports." In this case, you will be able to view Goals your direct reports are owners of and Goals owned by individuals in your org. Here is a feed of the company's most recent goals and their latest updates. Finally, in the "Settings" tab, admins are able to change the Goal display name for their company. For example, this may be useful if your company refers to goals as something else, such as "priorities." 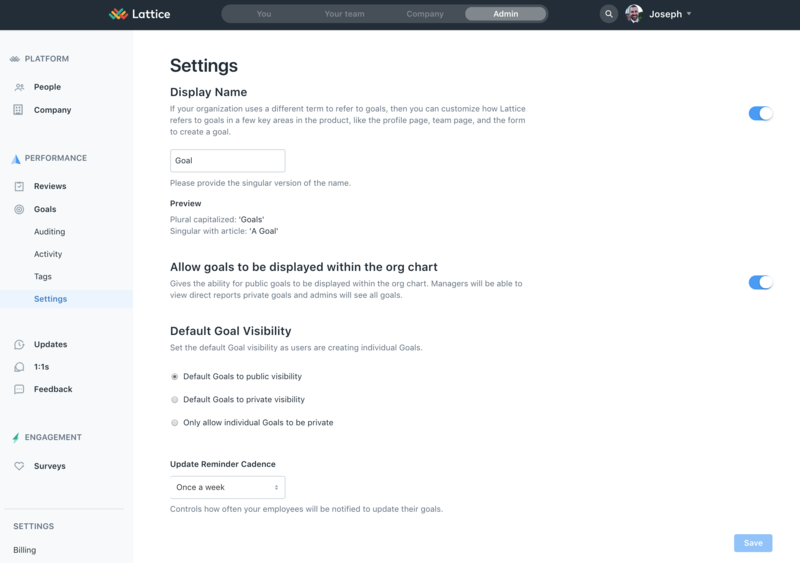 Admins can also choose if employees can create both public and private goals. If they want to allow the creation of both public and private goals, admins can set the "Default Goal Visibility." 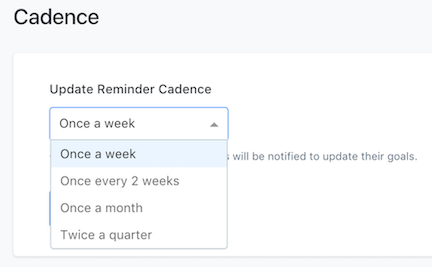 Admins can also set how often employees will be sent reminder emails to update their goals by selecting an option from the dropdown menu. 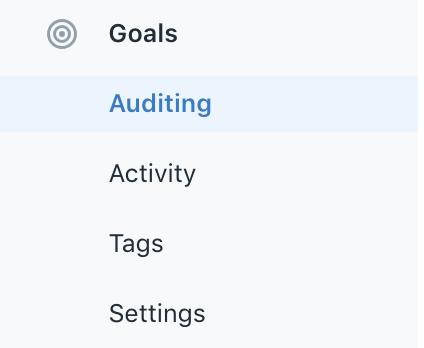 Company "Goal Tags" can be managed in the "Tag" section. Admins have the ability to create new tags, edit tag names, and delete existing tags.